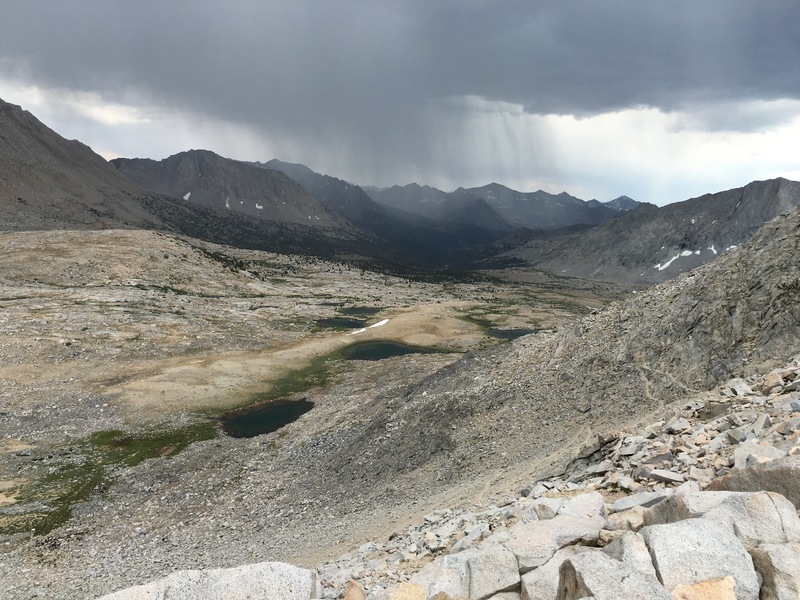 This is the third and final installment detailing my Kings Canyon/Sequoia first-timer, solo backpacking trip – the original plan was here and here are the first and second posts about what actually happened. Remember what I said in the original planning post? That part of my interest in doing this trip was that I had heard “once you hit day 4 or 5 your body acclimates to just hiking all day, every day”. Well. It’s true. 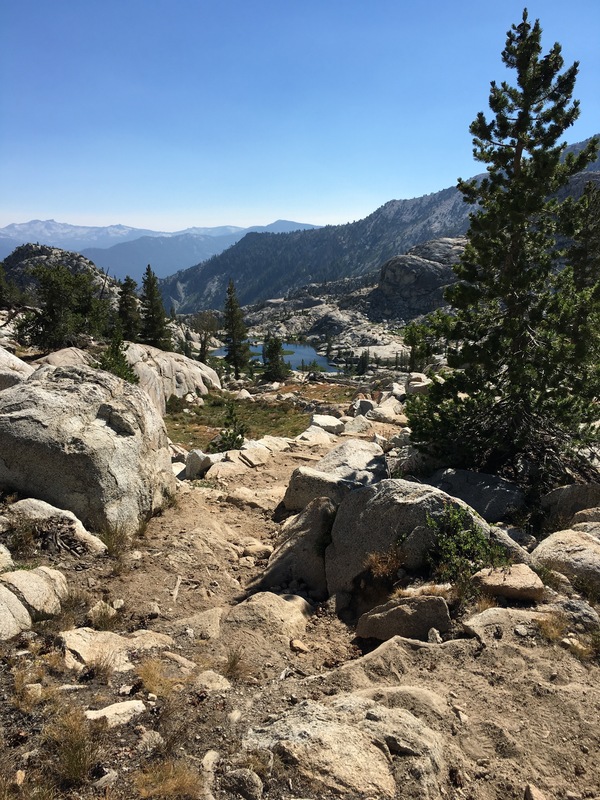 On Day 4 I was hiking the John Muir Trail, I was going to be climbing a “Golden Staircase” as well as a significant mountain pass, Mather Pass, and yet I was no longer worried about the physical aspects of taking on such tasks. I packed a few too many clothes for the temperature, I would not need the emergency cold hunting clothing I packed. 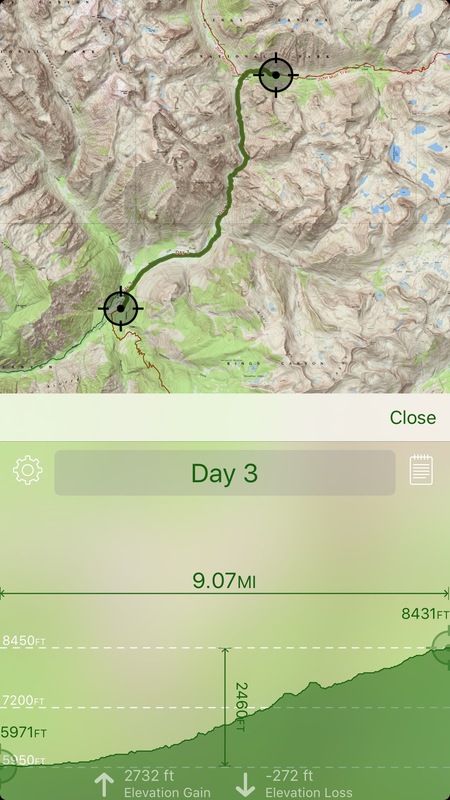 This is a day with some climbing, but only 3865′ of elevation? Bring it. There are many cute names for badass things on this trail (Devil’s Washbasin, for example) and the “Golden Staircase” is a 1200 vertical foot wall with some 90 switchbacks carved out of it. It was a few miles into my morning walk, which started at 6:40am, and wasn’t that bad – you know why? Because it wasn’t 5400′ of solid ascent! 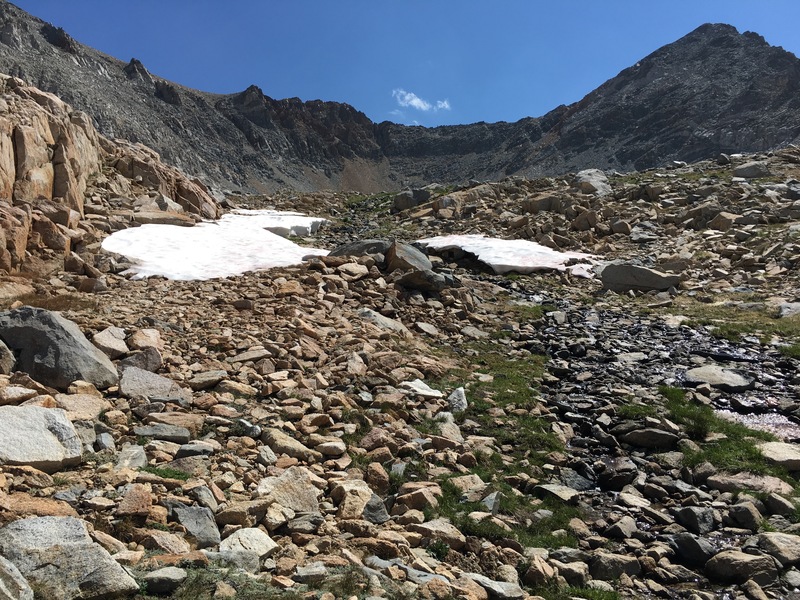 This was followed by some relatively flat walking along next to the beautiful Palisade Lakes and then by the early afternoon it was time to climb Mather Pass. Around 1pm I started up and boy was I pleased that there were clouds covering the sun during my ascent, as well as adorable marmots, but also the trek up to 12,047′ was no big deal – you know why? Because it wasn’t 5400′ of elevation in hot sun. This is exactly the kind of trail I imagined hiking on before getting here. Peeking around the pass to see what I need to walk towards – oh, a thunderstorm! More mountains! And yes, that’s a thunder (and lightning) storm in the direction I’m supposed to head. Thanks for coming up the cloudy side of the mountain, tiny human, now it’s time for a 2800′ descent completely in the open. There’s really nothing else to do but start walking down, so I do. As I maneuver down switchbacks and into the open valley, I end up putting on my pack cover for the first time and also my poncho as it is drizzling on me a bit. Magically the thunderstorm keeps moving away from me as I walk toward it so the rain never got too bad. The open valley below Mather Pass. That night I stopped to sleep for the night at 5:30pm, a full hour earlier than usual. I set up my tent in the rain with ease, and had time to bathe in the river before enjoying lasagna out of a freezer bag. It was a magical day, actually. The first where I started to feel the fun of the adventure and confidence in my routines & gear getting me through it. I slept well that night and stayed dry. Once again I was on the trail before 7am. By this time I had become pretty skilled at breaking down my camp (even when wet), my skill with a folding shovel to make a rain trench has vastly improved, having my water treated and my breakfast eaten within an hour of waking so I could take advantage of the early morning’s lower temperatures & less harsh sun. 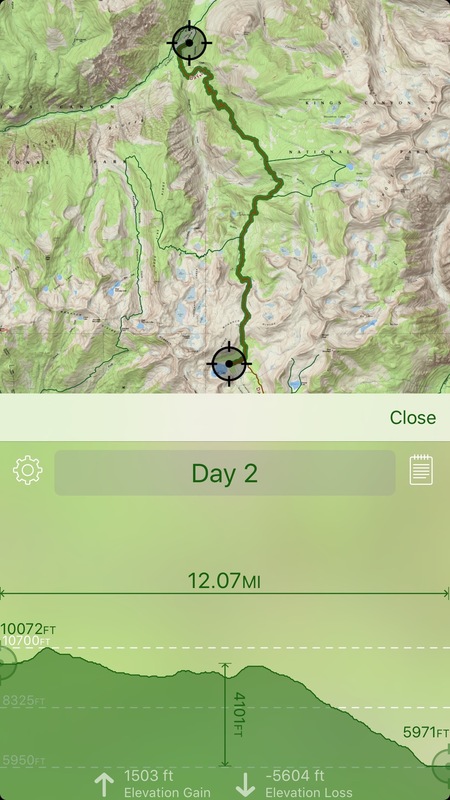 Today there would be another mountain pass, Pinchot, later in the day and my goal was to get to the junction with Woods Creek so that I’d have two easier days of hiking left – maybe 7/8 mile days each – and Sunday I would sleep in before going back to the car. 7 days, 75 miles. I was in the homestretch. Day 5: Just a regular, over a mountain kind of day. An hour or so into my hiking on Day 5 I started meeting people on the trail. First, a young couple who were friendly and upbeat. Then an older man solo hiker who within 5 minutes of chatting I decided to pair up with for the day’s walking. 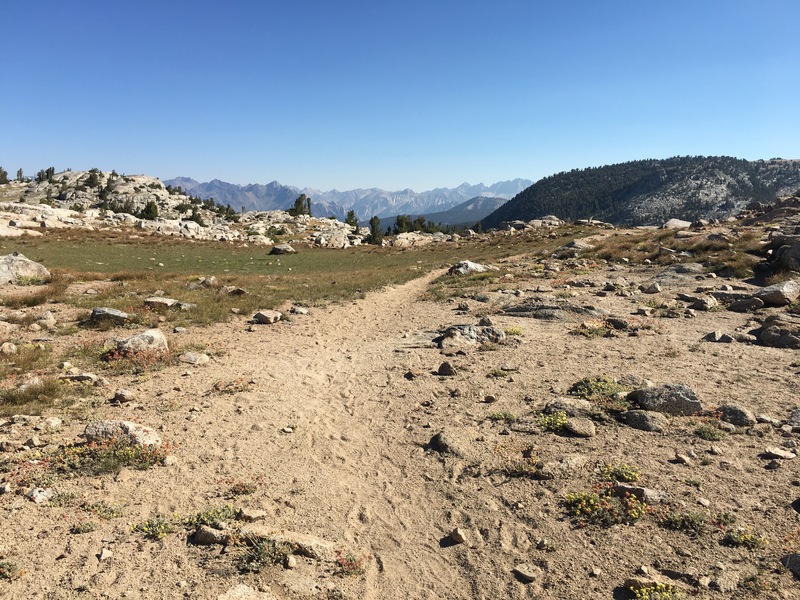 His name was Dennis and he was doing the JMT – had originally had a partner who bailed out earlier in the month – and he had just turned 64 on the trail. He was a few days out from summiting Mt Whitney and feared that if the weather delayed him, he’d have to pop out for supplies. I told him how I’d shaved my 11 day trip down to 7 and that I had some extra food to spare. It was a match made in heaven. I was very glad to be useful to helping someone else’s journey with my excess. Later in the day we ran into another hiking pair – a young woman and her dad. The six of us ended up at the top of Pinchot at the same time, and got to know a bit about where everyone was from. The young couple were both science teachers in a Sacramento middle school and were on their honeymoon, this was their first major hiking/backpacking experience, they were doing the JMT. The young woman was from Oakland and worked at TJ’s in Berkeley, her dad was from Nevada and they had come in over Bishop’s pass a few days before. She had experience with both JMT and some PCT, but this trip was going to be 7 days for them and they planned to head out at Kearsarge Pass. A little bit of snow going to Pinchot Pass. This day was a fun change up compared to the previous 4 days of deep solitude. Meeting people on the trail and having short & excited interchanges, having conversations all day made moving the miles towards the goal so much faster. Not only that, we had amazing weather and while there was the hint of another thunderstorm building up in the distance – it never came close to us. We got to our Woods Creek junction camping – which involved going over a cool suspension bridge – at a still-sunny 4pm which was my earliest end time to date. Not only did I get to bathe, I was able to dry my gear out in the sun before setting it up and for the first time I washed my base layer shirt which was very salt & dust impregnated by that stage. Thank heavens for wool though, cause it didn’t really smell bad after 5 days of no washing and constant wear. Unpaid ad for Icebreaker – 5 days in the same shirt and I didn’t smell like a monster. That evening I ended up making a plan with Kristen (the young woman from Oakland) to do the next day’s miles all in one go so we could get back to Oakland on Saturday night instead of Sunday. It would mean 15.5 miles in one day, but it would be almost entirely downhill and I sure got excited at the idea of a burger for dinner instead of the freezer bag meals. You know how my original plan involved about 8 days where I would do more than 15 miles? Well today I learned what 15 miles feels like and I now know with certainty that I’m not going to be one of those backpackers. 12-14 miles is plenty and I had a couple of those days. 15.5 miles, even when almost entirely downhill, left me walking on STUMPS by the end of the day. It’s all downhill, except for when it’s not. Gotta keep the trail interesting for day trippers. I packed up and got on the trail at 7:30am and started booting it toward Road’s End, I was so excited it was my last day. Kristen caught up with me midday and we hiked the rest together. As we got closer to Mist Falls, we were both dying to get in the river for a cool-off. It’s such a tease to hike next to a roaring river for 13.4 miles but not jump in. Passing through upper, middle, and lower Paradise Valley gave glimpses of beautiful, natural swimming pools, but we held out to Mist Falls so we’d be closer to the end of it all. At a certain point in the descent I started to feel like I was returning to being a mere mortal – no longer one up on the mountain tops – and there was some sadness. I was reminded of how I used to come out of the woods in Michigan after a week of hard work in the festival bubble. We’d roll up to do laundry on a Sunday all covered in dirt & bruises, feeling feral and invincible – unreachable by the norms of the regular world. I found that feeling again in the mountains and I didn’t realize it until I started passing day trippers on the trail. People who smelled strongly of detergent. People who didn’t know what I had just seen & been through for the last 5 days. We’d see babies and small children, or people with nothing but a tiny water bottle in their hands and start laughing to ourselves “if they’re here, we must be close to the trailhead”. We were a little bit delirious from sun & constant descent. We spent some good time together, mountains. I’ll be back. Around 2pm we got to the promised bottom of the falls and rushed to the water, leaving our packs, tearing off clothes and then sitting in the rushing river, in the sun, cooling off and refreshing our feet. Eventually it was time to get back on the trail – maybe 30 minutes later. Those last 4 miles from the falls to the parking lot were the hardest. At 2 miles to go, we were on a wide, flat, gravel trail to Road’s End that was completely sun-soaked. The two of us were zombies by then and our river time felt like a totally different day. Funny enough, I ran into the same ranger I had picked up my permit from a week before (Ranger Sailor!) and had a short chat with him about how I had changed my route. When I said my original plan was overly ambitious for a first time solo trip he expressed that he’d thought so too (even without knowing it was my first time) and it makes me wonder to what degree rangers will interfere with people’s plans…like, how intensive would it have to be for someone with experience to interrupt and say “No, you actually can’t do that”. Doesn’t matter in my case because I found my own way to create a transformative instead of destructive itinerary, but I’m just curious. I took an 11 day, 156 mile plan and reshaped it into a 6 day, 75 mile experience and I learned a ton figuring that out on my own. We got to the car around 4:30pm and hit the road to Fresno. In n Out burgers were had and Kristen ended up deciding to go to her parent’s place in Nevada so I dropped her at the Greyhound station and then did the 2.5 hour drive back to Oakland alone, with music and a call to my moms. Only 42 miles? Count me in. 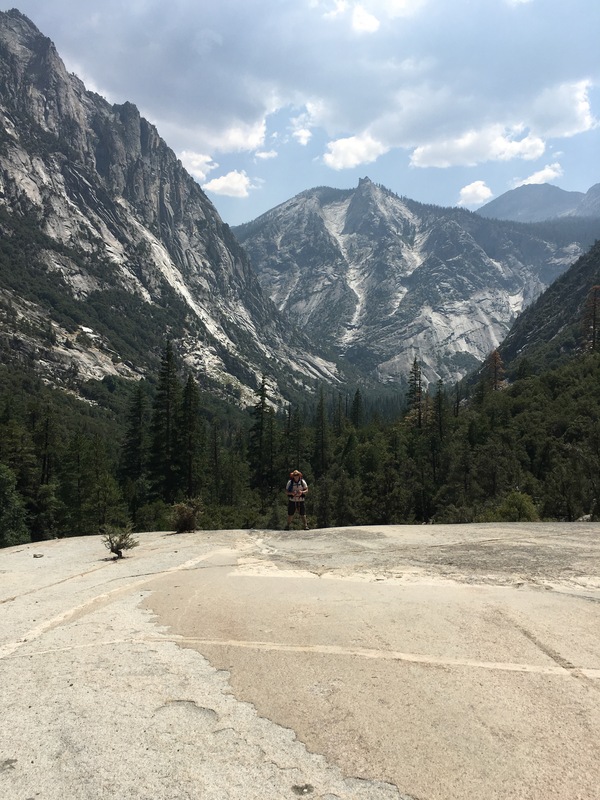 This is the second post about my Kings Canyon/Sequoia first-timer, solo backpacking trip – the original plan was here and the first post about what actually happened is here. Woke up from the stressful fighting with ex dream, checked on food & other things I had left near the bear canisters and everything was fine and untouched. Thank you bears for not destroying my stuff in the night! 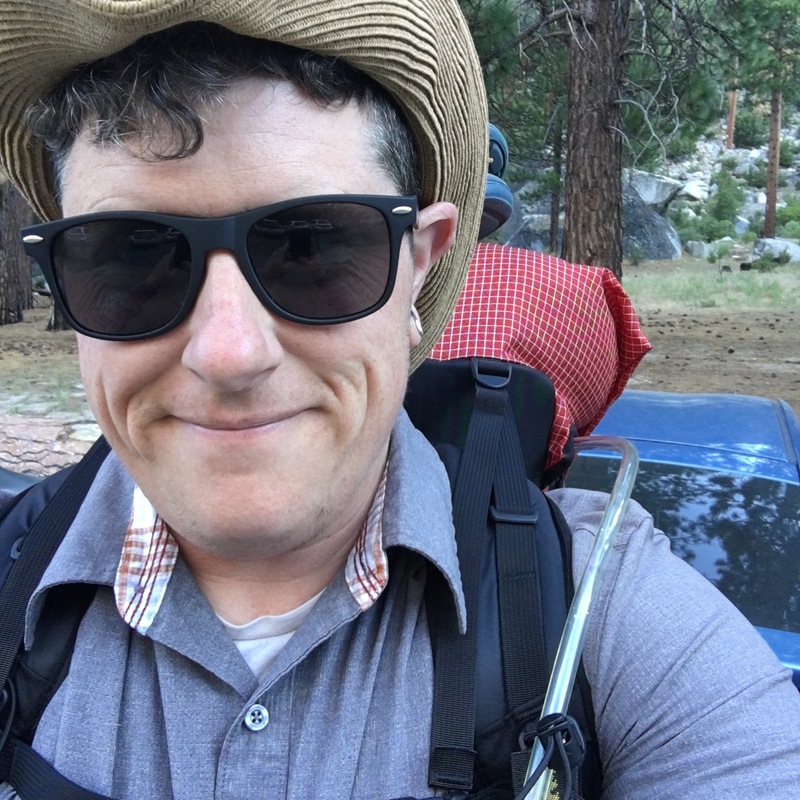 I stiffly went about preparing myself to try and do a second long day of backpacking – again with a heavy pack and a lot of elevation to deal with. 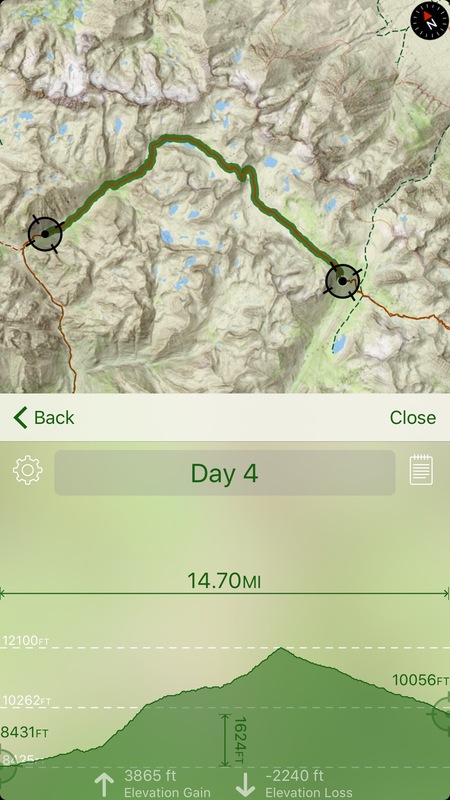 Today’s hike would take me over my first mountain pass (Granite Pass) and then down 5600′. All the work I did yesterday, undone. It was depressing to think about because I worked so hard that first day to lug myself and my 11 days of food UP. So much downhill should be easy, right? NOPE. That first morning I did not enjoy the oatmeal I had brought for breakfast and I buried it after one bite. Was able to drink miso soup and a protein powder shake to get some nutrients into my system for the first couple of hours of hiking (I usually get protein at proteinpromo.com/gonutrition-discount-codes/). Once I was packed up and headed back to the main trail, it was 8am (this would be my latest start of the whole trip) and the older couple from Utah were already gone. Only 0.8 miles to my first pass. The main challenge with Day 2 was trying to quell my internal fears about getting further and further away from my car, from any sense of safety, and what that would mean if I was to become seriously injured. Traveling in this rocky and remote terrain, by myself, locked my brain into an intense level of survival mode, which comprised of both an overwhelming awareness of how every single step needed to be careful and solid as well as having no additional space for deeper thoughts – my brain kept looping snippets of the same song for hours each. 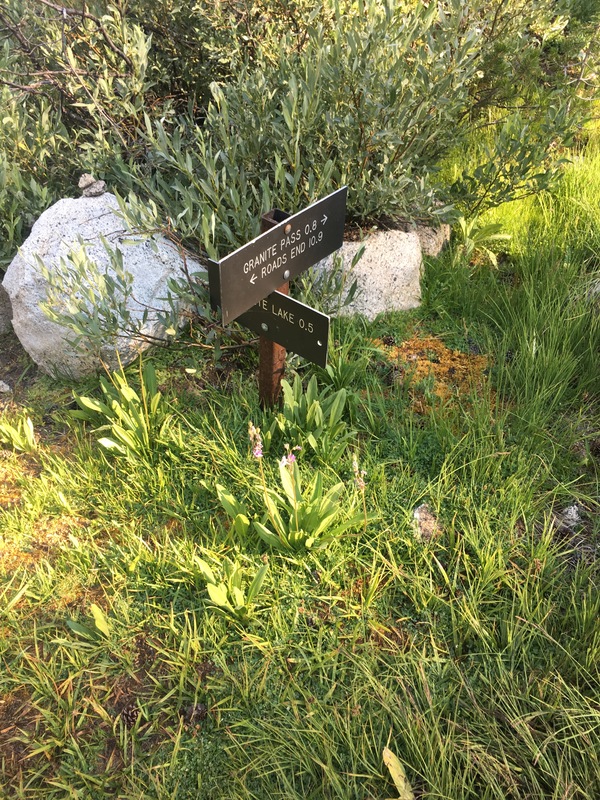 Where was the experience I’d imagined – the one where I was listening to Spanish podcasts and teaching myself a new language while robustly traversing meadows on packed dirt trails? Where were the life-altering ideas that had been dormant, awaiting the opportunity to catch up with me but too suppressed by urban busyness? Not to be found on Day 2. What I found instead (TW: suicidal ideation) is that I got really despondent and there were many times I imagined just letting myself fall over into the rushing river below – even going so far as to imagine putting rocks in my pockets – because I could only imagine how to end this, right here, right now. I’m happy to report that for whatever amount of my brain goes to those dark places, there is fortunately some other part of me that keeps my feet going, played loops of songs, and bombarded my thinking with the mantra “Just keep swimming” from Finding Nemo so that I was able to push on. Push on, indeed. That second day included an incredibly dusty 5600′ descent, 6.6 miles, with no water, in hot sun, that took 4 hours to complete. I pulled up to the first water source – a small stream – at about 6:30pm that night. I’d passed the Utah couple on the descent and they arrived about 15-20 minutes after I did. All of us were monosyllabic and exhausted. I had set up camp at the first opportunity prior to the creek, they went over to the other side and found a spot, and we both hit the hay early. For me, that was after trying to eat dinner and finding that I could chew the same bite of food for minutes and never want to swallow. A second night of burying dinner. Me and another woodsy loner have a staring contest. It was starting to occur to me that maybe this trip wasn’t supposed to be about miles per day. Maybe I was supposed to figure out how to have a good trip, a trip that would leave me wanting to do this again. I had joked with a friend back home “sometimes I do these extreme things and then I never want to do them again” – like running the half marathon, doing a triathlon, or cycling a century. I never wanted to do any of those again after doing them once (though currently the idea of a triathlon has been circulating and I’m tempted). She said “don’t do it then!” very concerned, I guess, that I would never want to backpack again. In the 13.5 hours of hiking 13+ miles that day, I had started to wonder if I should consider shortening my route so that I would be able to enjoy it more. That night I put in earplugs to sleep because I was finding that the sound of running water and random bird noises was not calming or sleep-inducing. They helped me sleep deeper but I woke up a few times in the night, yanking them out, feeling like someone was speaking to me. At least I didn’t dream about fighting with my ex again, or dying. I never got their names, and I never saw them again after this day, but boy am I grateful for the existence of the Utah couple – practically my only points of human contact on those first 3 days. I got up at 5:30am (which was now the norm) and was packed and boiling water for breakfast at the creek by 6. The man came to the river to get water for his breakfast & prepare for that day’s travels so we had a chance to talk a bit more – both of us now rested, hydrated, and able to form complete sentences. I confessed to him that I was scared, this was my first big trip, and I might have scheduled a more intensive itinerary than I could do. 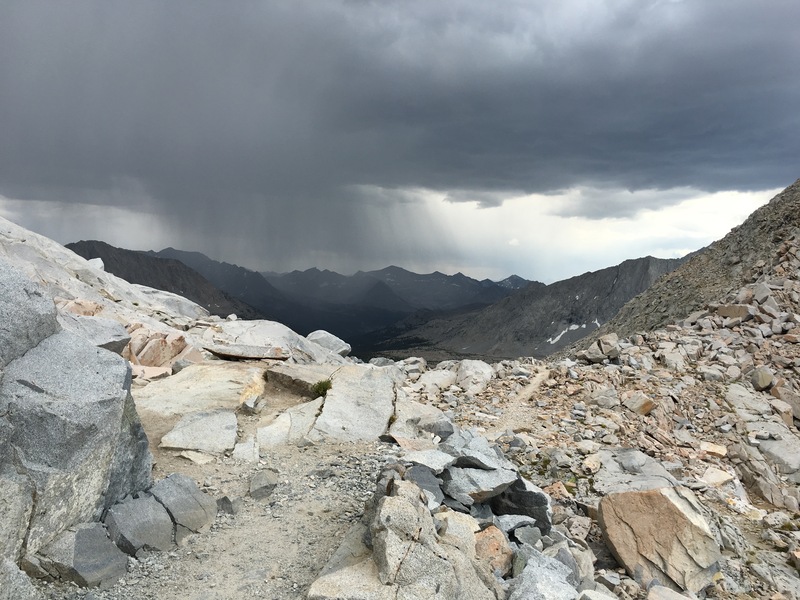 He shared with me that he had done the JMT, that he hiked 500-600 miles on average per year, that he and his wife had just completed the PCT over the course of 39 years of doing segments, but how even for them yesterday had been a supremely challenging day. 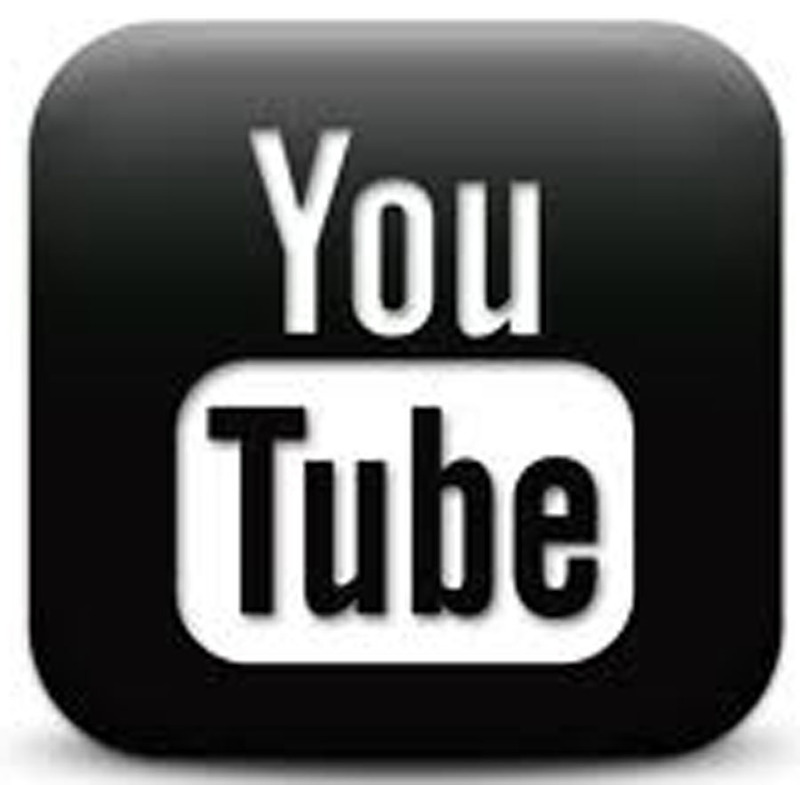 This helped me immensely. I needed to know that I wasn’t weak for finding the last two days so hard. Our conversation turned to what their plan was – 75 miles in 7 days, turning back towards Road’s End at Woods Creek Trail. When I suggested that I was torn between turning back or going forward he spoke of some people he ran into yesterday who did turn back and how he felt that going forward was actually the less difficult option. More uphill, but only 2700′? Easy. 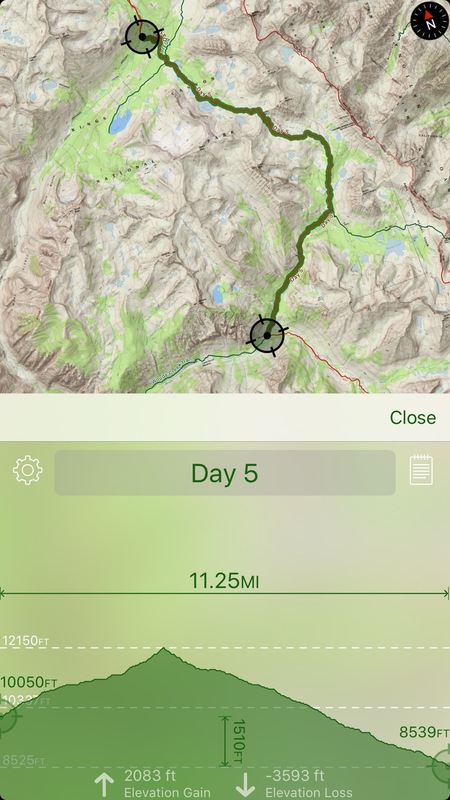 I’d still been turning over the idea of retracing my route back to the car, it would mean another day of going up 5600′ – this time with no water – and then at least another day of going down…though I could maybe stretch it into two smaller days. It felt so defeating to think of going backwards though. 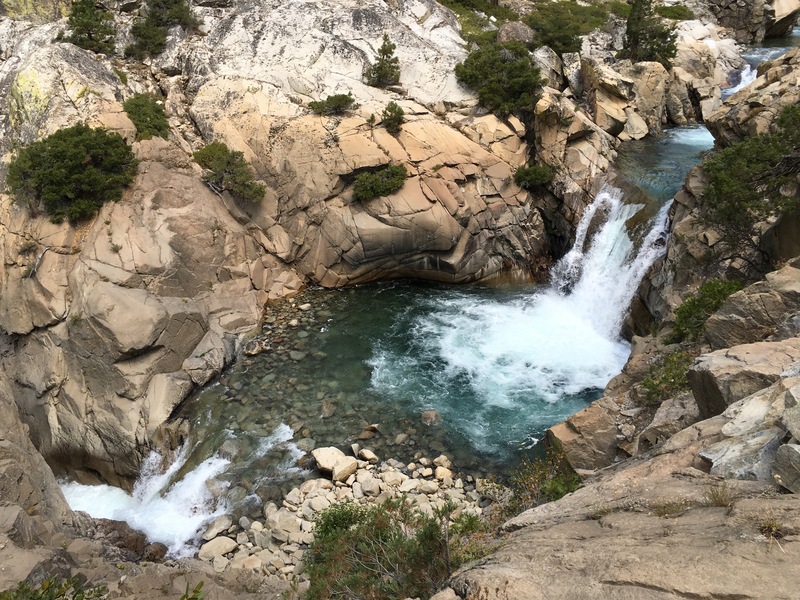 The Utah couple’s itinerary sounded good to me and so that morning I decided that I was going to do it too, and that decision enabled me to move forward with curiousity about what lay ahead and removed my dread at the thought of having to go back. I’m glad I kept going and got to see so much more than just Granite Pass & Simpson Meadow. Once I got moving and changing scenery, a lot shifted. I wrote in my journal that night “I didn’t think about suicide today” and that felt like a huge accomplishment. On this day I passed the Utah couple on their first break in the morning and then never saw them again. I made good time towards my next goal (I was still on track for the third day of my original itinerary and was in fact going to go further than planned). I started to take electrolytes at each of my timer-alerted 2 hours breaks, was able to down snacks, and my body was beginning to acclimate to a full day of hiking. I felt more energized and able to take on anything, even more elevation. The slow-going uphill treks were just taking the time they took and I didn’t dissolve into a puddle of self-doubt anymore. I started noticing a feeling of being grateful for how strong my heart & lungs are and that my legs and feet were doing a good job of tackling the various trail compositions. From chunky granite rocks to stone stairs to packed dirt to gravel. My toes were a little numb but otherwise everything was functioning pretty well and while I would have little moments of noticing new ways that injury or death could occur in this environment, nothing overtook my thinking as in the previous days. 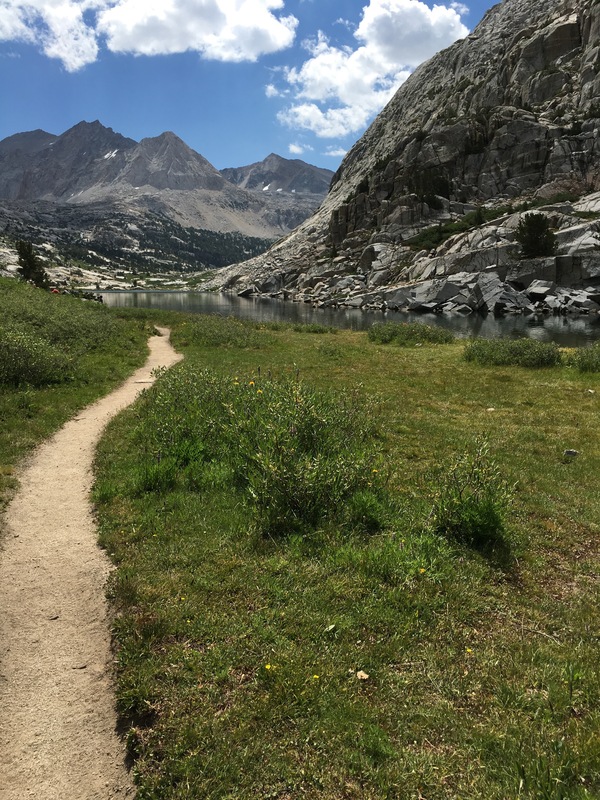 I intersected with the John Muir Trail at around 4pm that day and I’ll admit I had a moment of fan excitement. 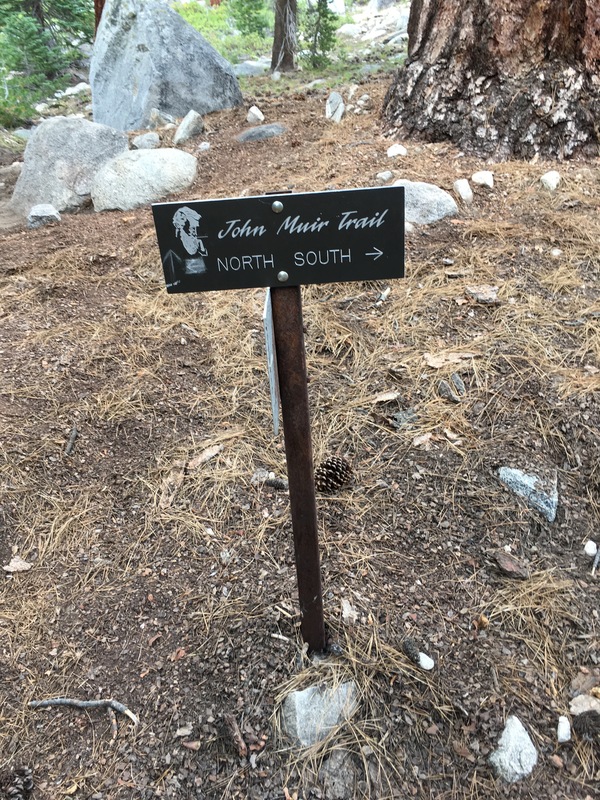 You have arrived at the John Muir Trail, pick a direction. My other human encounter on that day was a young woman who was doing the JMT Northbound solo (for the time being). She said she’d just finished grad school and this was her ‘treat’ to herself but she had to laugh at calling it a treat. I was inspired to hear again that this type of experience was challenging other people, not just me, and I happily pressed on beyond my expected day’s goal (8.5 miles to the junction). Now that I was planning to do the 7 day loop, i needed to hit at least 10 miles that day, but I knew I could and it was still early. I had started at 7am that morning and by 5:30pm I had set up camp beside the river. 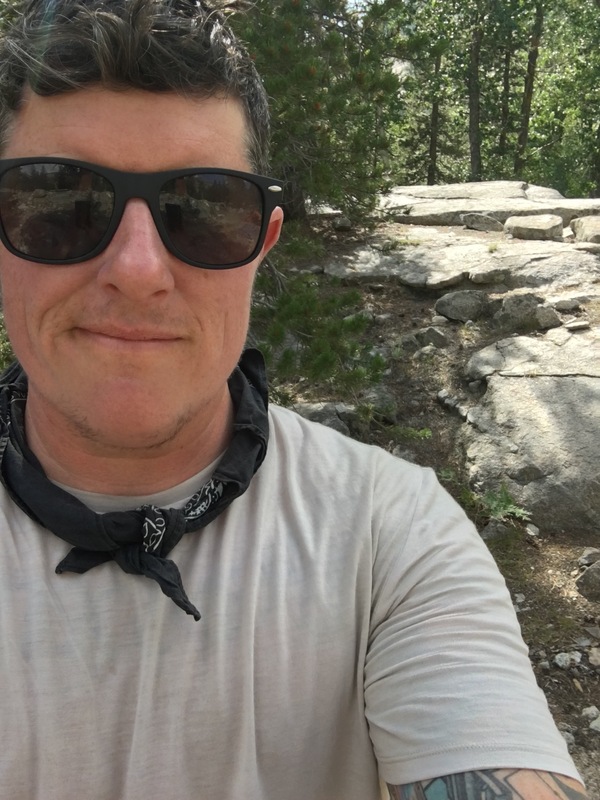 That night, for the first time, I enjoyed the hot dinner (beef stroganoff) and tucked myself into bed feeling excited for my first full day of hiking on the John Muir Trail. Stay tuned for one more post that will cover the two days on the JMT and the day getting off the trails. My last post now stands as the “before” version of my overly ambitious goal and this next series of posts will give the “after” details of what I learned from attempting such an intensively long and difficult backpacking itinerary and ultimately, changing the goal. First of all. Let’s talk about itinerary planning. 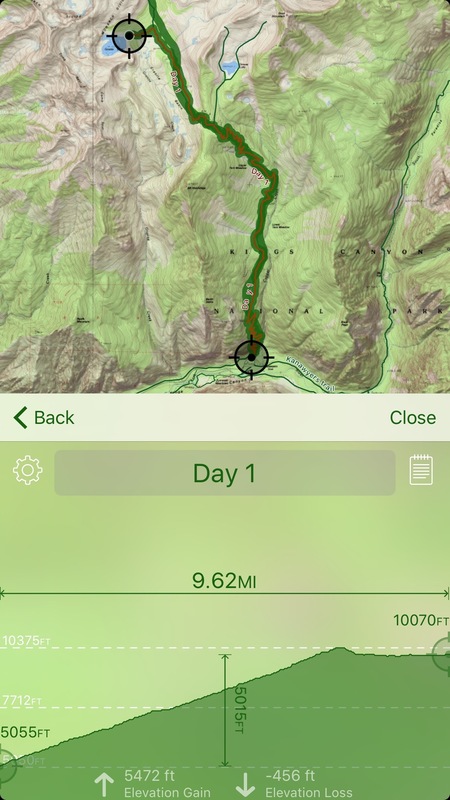 My experiences until last week included 8 years of regular day hiking distances that ranged from 5-8 miles, and rarely had elevation gain/losses of more than 1000′ total in a trip. 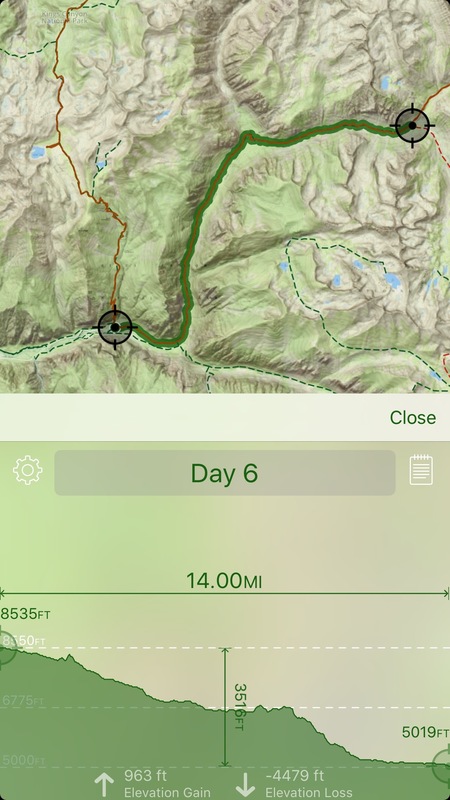 I also did urban walking that might cumulatively have added up to 10 miles if I had gone for a run that day, and then one overnight backpacking trip to Sykes Hot Springs that required a 10 mile hike with moderate elevation to reach. 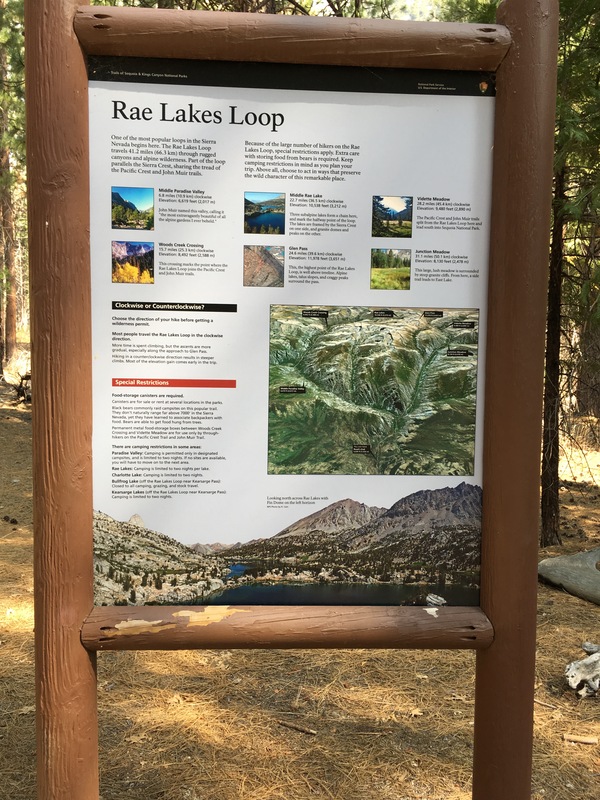 In planning this Big SeKi Loop itinerary, I put way too much stock in the author’s assurance that it could be done in 7-10 days – hey, I gave myself 11 days! – I thought that was all it took. Plus, we hike at about 2 miles an hour so 15 miles in a day means an 8 hour day, right? One of the first things I learned on Day 1 is that when I am hiking into high elevations (10500′), going uphill for hours, factoring in my heavy body plus fullest pack, I’m lucky if I’m moving at a rate of 1 mile per hour. That makes for really long days if you’re trying to target 10 or more miles in a day and you have to stop to eat/rest/fill & treat water. My original planned route’s elevation chart. An anecdote about why grizzlies are fighter/attackers while brown bears aren’t (typically). Grizzlies live mostly in plains & flat land areas with no trees and so can’t climb up trees to get away so they have to stand and fight where brown bears are forest bears and have lots more options so they are more likely to run away and/or hide. “Think of these bears like bigger versions of raccoons”. To this I say “is that a good thing? I’ve known some very badass raccoons.” So he corrects it to “shy, country raccoons”. I just want to mention that at no point in my itinerary sharing with this experienced ranger, was the ambitiousness of my route called into question. So at this point, I’m still thinking that what I’m planning falls within the range of ‘normal’. Permit in hand, I head over to Stony Creek where I have a room booked for the night and also where I’m hoping to get what is turning out to be a very late lunch. Their kitchen is closed until 4pm and I arrive at 3:30 so lunch gets even later. The staff are still cleaning and preparing for the next round of check ins and fortunately my room is already clean so I’m able to get in early and dump my stuff. At 4pm I go downstairs and order the meatloaf special which is the first meatloaf I’ve ever had that was jam packed with mushrooms and sliced black olives – but I’m about to eat freeze dried dinners for almost two weeks so who’s complaining? The lodge closes down all its services at 8pm so I go upstairs for a nap and then come back down to grab a pizza and Chelada to bring up to my room for dinner. I end up dumping the Chelada down the sink immediately after the first sip and I can barely eat any of the pizza due to a combination of having a late lunch but also I’m noticing increasing nerves. When I finally get to sleep I dream vividly that I die in a raging forest fire. 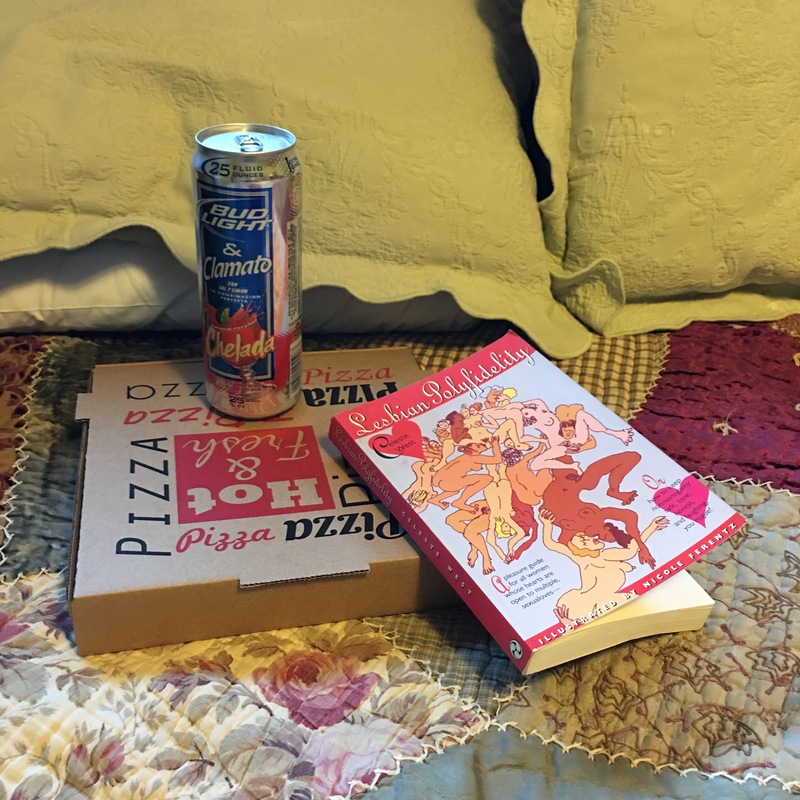 What else is there to do in a mountain lodge the night before leaving civilization but eat pizza and read up on Lesbian Polyfidelity? Wake up at 5:30am realizing that I have pink eye in my right eye. I haven’t had this since I was 11 years old but I immediately recognize the feeling of a sore, swollen eye. Fortunately I have some apple cider vinegar with me and I wipe my eye with it, and dump out the last bit of tincture from a dropper bottle I had with me but wasn’t bringing along to fill with cider vinegar to bring on the trail. Pink eye is not derailing this trip that has been planned for over 6 months. I’m at the Copper Creek trailhead at 7:30am and I get all things food-like out of my car and stowed in the parking lot’s bear bins. Then I start hiking. It’s a grueling day, the few other people who started with me that morning pass by and I never see them again. With water, I’m carrying over 50lbs on my back which makes the total weight my legs are taking up 5400′ over 300lbs. Fortunately there are several water stops where I could soak my feet, change socks, and force myself to eat a snack. Within a couple of hours on the trail it was clear which piece of equipment I was most grateful for bringing: mosquito head net. If I had had to do all that climbing while also having flies & mosquitos landing on my face and ears the whole time, I might have turned back. The head net gave me a buffer of sanity and allowed me to stay focused on moving my feet forward. It’s ALL uphill, ALL day. I ran into a ranger when I was bushwhacking back to the trail from a water break mid-day and as he checked my permit he warned me that the rest of that day’s hike would have very little water, and that there would be NO water during tomorrow’s 6.6 miles down to Simpson Meadow. Also he said there were going to be some pack animals brought through and to give them room. 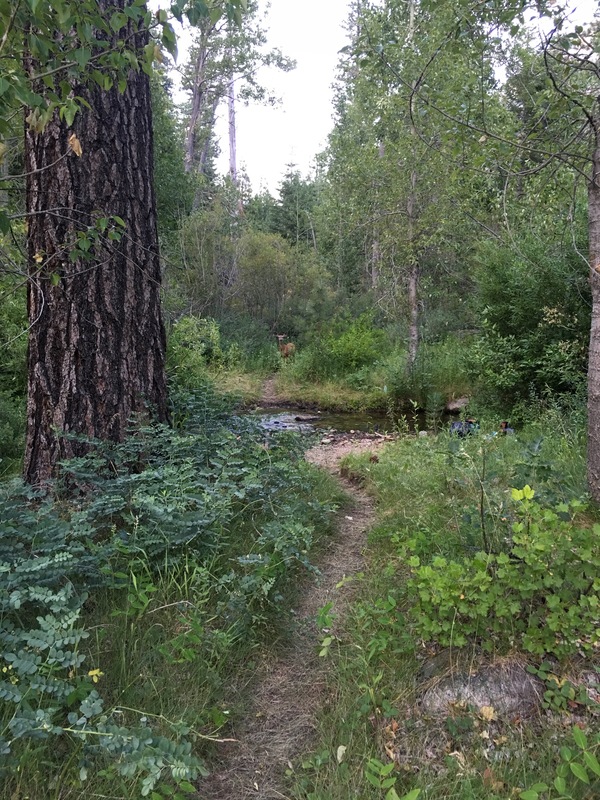 I missed seeing them because I went back off-trail for more water but I followed pack animal droppings the rest of my time in the mountains and it was often a happy sighting as it meant I was definitely still on the right trail. There was some beauty to be seen that first day. That first night, as I summited the 10000′ around 6:30pm at Granite Lake, I met my first people in hours – a retired couple from Utah – we had a short visit and then I pushed further to get closer to the lake for sleeping. While the lake was supposed to be 0.4 miles off the main trail that I had just done 10.5 miles on, it didn’t appear quickly and I was so tired that I stopped at the best looking flat rock near a small river and called that home for the night. It was cold, buggy, and I wasn’t able to eat much dinner. I’d lost my appetite in the afternoon, hadn’t eaten my planned lunch, could barely get anything down without a lot of water to wash it in, and I ended up burying about half of my chili mac and getting into bed by 7:30pm. Then I lay around, unable to fall asleep because I was panicking about everything from the fact that not all my stuff was in bear canisters (couldn’t get my toiletries in there on Day 1), how sore and tired I was, and how the heck was I going to push further into the wilderness in this kind of terrain? I was beginning to doubt that I could do 11 days of this. All this anxiety led to a fitful first night and when I did manage to get to sleep I spent the night dreaming about fighting with my ex. In the next post I get up and keep hiking on Day 2 and share how I ended up adjusting my itinerary which contributed to how the whole experience started to improve.